Many people are struggling to lose weight, but those who have a lean body and a very active metabolism are always wishing to add a few kilos. It is indeed a difficult task to put on the weight. A diet comprised of frozen meals, fast food and soft drinks might work, but it’s not at all the healthiest manner to gain weight. However, Indian breakfast recipes focused on beans, lentils, grains and vegetables can help you to gain healthy weight. Calorie count is an extremely important aspect of weight management regimen. You need to eat more calories to gain weight. You can calculate the required calories using an online weight gain calculator. It is extremely necessary to gain weight at a slow but steady rate. For example, if you need 1500 calories/ day to maintain your current weight, eating 2000 to 2500 calories/ day is necessary for weight gain. Listed below are several healthy Indian breakfast recipes for weight gain. White bread may help you to gain weight faster, but Multigrain bread or Whole wheat bread is way healthier. Hence, it is beneficial to opt for healthy breads such as bran, oats bread, rye, whole wheat or multigrain bread. 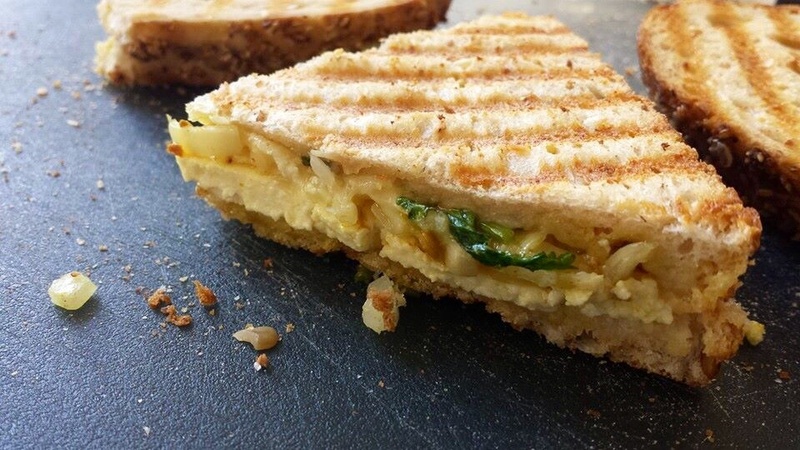 Whole wheat Paneer sandwich is rich in Vitamin A, Vitamin B6, Vitamin C, calcium, iron, folate, and magnesium. A protein packed whole grain Paneer sandwich, a banana and a glass of milk will be a great breakfast for healthy weight gain. To make the Paneer soft, soak the pieces of Paneer in hot water. Heat oil in a pan and add Cumin seeds. When the seeds splutter, put ginger- garlic paste, carrot, and green chili. Cook for a couple of minutes. Add garam masala, turmeric powder, crumbled paneer, red chili powder, coriander leaves, and salt. Cook the mixture for 2-3 minutes. Add few drops of lemon juice. Mix it properly and transfer it to a bowl. Spread the filling on a bread slice and cover it with another buttered bread slice. Put it in the sandwich maker. Take out the sandwich when the colour is golden-brown. Oatmeal is one of the healthiest breakfast foods. It mostly contains complex carbohydrates which give a steady supply of energy as they are digested and absorbed a lot slower rate. Oat is an excellent source of dietary fiber, phosphorus, manganese, biotin, copper, vitamin B1, magnesium, zinc and chromium. Heat ghee in a pan and add Mustard seeds along with Cumin seeds. When the seeds splutter, add green chili, shredded coconut, boiled Carrot, boiled Green peas, Potatoes and salt to it. Mix well the ingredients. Sprinkle some water if the mixture is too dry. Cover the pan and cook it for 10 minutes till the vegetables turn soft. Add the cooked oats, mix well and serve hot. Parathas are the most popular Indian breakfast for weight gain since it has a broad mix of ingredients which appeals to everybody. 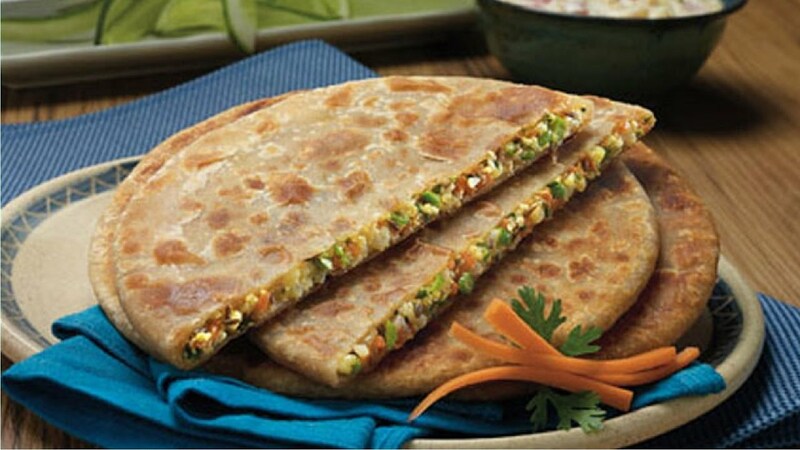 Assorted vegetables, spices and cheese make a mouth-watering filling for Parathas. A mix of plain and whole wheat/multigrain flours is used to prepare Paratha as it keeps the dough elastic enough to accommodate the stuffing. Since the Paratha has filling of vegetable, it contains Vitamin A, vitamin B6, selenium, copper, iron, manganese, magnesium, and phosphorus in sufficient amount. Mix the flours and salt in a large bowl. Knead well with water and prepare a dough. Divide it into six equal medium sized balls and set aside. In another bowl, mix coriander, onion, cumin seeds, red chili powder, grated cheese, and salt. Divide the filling into six equal portions. Stuff the filling into the balls and roll it into a circular Paratha. Heat a non-stick pan. Cook the Paratha on both the sides by smearing ghee. Serve it hot.